LONDON, United Kingdom	- 01 Dec 2009: IBM (NYSE:IBM) today announced the launch of its London-based IBM London Analytics Solution Centre, the latest addition to its global network of analytics centres. As part of a global multi-million pound investment intiative1, this newly-created centre will help IBM apply its advanced analytics expertise to the complex business challenges facing its UK-based clients. Leveraging its London location and IBM's deep industry expertise, the centre’s initial mission will be to focus on the UK financial services sector. It will help IBM’s financial sector clients to develop systems that provide improved visibility and tracking of risk positions across markets and asset classes, as well as to drive information management to support improved client satisfaction and cost efficiencies. 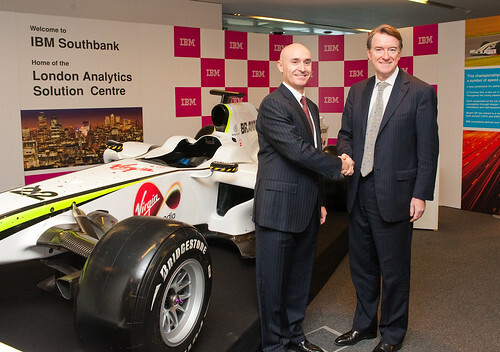 Brendon Riley, Chief Executive, IBM UK (Left) and Ireland, and Lord Mandelson, UK Secretary of State for Business, Innovation & Skills share a few words on organisations' need to manage data under pressure in order to win as they view the 2009 F1 World Championship-winning Brawn GP car at the launch of IBM's London Analytics Solution Centre. Over time, the centre will expand to help clients across other areas of business. These include: energy and utilities companies, as they seek to roll out smart grids and intelligent metering; public sector organisations, as they develop smart city and transportation initiatives that reduce congestion and improve public safety; and, pharmaceuticals firms as they introduce smarter ways to improve the speed and quality of drug development. The centre will be the focal point for a UK & Ireland analytics team which will initially number a total of 400 consultants, software specialists and mathematicians. It is anticipated that the team will double in size as demand for business analytics and optimisation services increases. The centre will be based at IBM’s Southbank office. It will draw on a wealth of IBM expertise from IBM’s Business Analytics and Optimisation global consulting organisation as well as from technologists at Europe's largest software development laboratory – IBM Hursley in Hampshire, UK. The London centre will have access to IBM’s comprehensive Information Management portfolio that includes technologies integrated following the acquisitions of Cognos, iLog and SPSS. It will also provide expertise to help organisations embed new sensor technology into their processes to gather detailed performance and management data on which to base analysis and decision-making. RSA has used analytics software from SPSS, an IBM company, to drive a 15 per cent increase in customer satisfaction, retention and lifetime value. The technology is enabling RSA to capture detailed data about customer attitudes, opinions and preferences, regardless of their geography, language or communications channel, at various points in their lifecycle. RSA can then use this information to identify the key drivers of satisfaction, such as first call resolution and access to support, improving the overall customer experience and offering more appropriate products. “In the current climate, customer satisfaction and retention are key priorities for us. The technology has been instrumental in measuring customer service and providing a deeper understanding of behaviour and intention, helping us to improve our business processes,” said Nigel Bowman, Head of Customer Experience at RSA. IBM is working the Operational Riskdata eXchange Association (ORX) to develop new analytics that help ORX member banks quantify risk exposure. ORX, a not-for-profit association owned and controlled by its members, is the predominant global consortium for secure and anonymous exchange of operational risk loss event data used by over 52 leading financial institutions across 18 countries. ORX, in partnership with mathematicians from IBM Research, has analysed more than 135,000 loss events, each event over €20,000 in value, to a total value of €42 billion. This has provided new intelligence that has enabled its member firms to secure a more accurate understanding of exposure to potentially damaging operational risk. Lord Mandelson, UK Secretary of State for Business, Innovation & Skills speaking at the launch of IBM’s London Analytics Solution Centre about the contribution that analytics can make to help improve the competitiveness of businesses in the UK. 1 IBM previously announced a significant expansion of its business analytics capabilities with plans to open a network of Analytics Solution Centres around the world. The London investment forms part of this previously announced expansion full details available here. IBM has opened six further analytics solution centres this year in Berlin, Beijing, Dallas, Tokyo, New York and Washington, D.C. In support of its global investment in Business Analytics and Optimisation, IBM expects to retrain or hire as many as 4,000 new analytics consultants and professionals worldwide.